We offer a Standard Service and an Extended Service. The level of service you wish us to provide depends on your own personal requirements. With either service, we will work with you to develop the architectural design for your home, whilst also considering your budget. This is the service for you if you are confident of doing the work yourself or with your own builder, and simply require the necessary Planning Permission and Building Regulations Approval. Carry out detailed measured survey of existing home. Advise on any other surveys that may be required (trees). Produce sketch proposals and estimated costs for the work. Advice on whether Planning Approval is required or if work can be carried out under Permitted Development. Advise if any other consultants should be appointed (Structural Engineer). 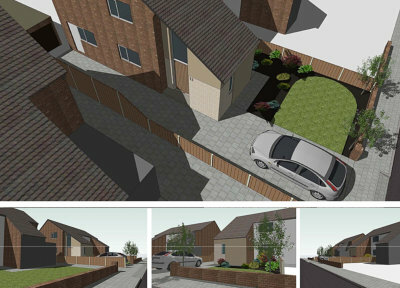 Prepare and submit Planning Application (or Lawful Development Application if works fall under Permitted Development). Prepare and submit detailed drawings for Building Regulations Approval. Advise on procedures for obtaining Party Wall Consents where necessary. This is the service for you if you want the peace of mind that having your project monitored will bring. 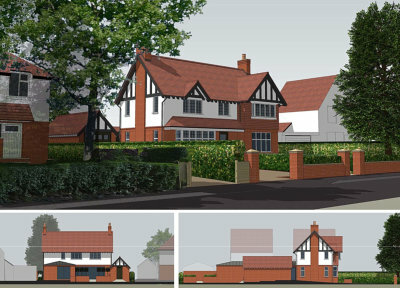 Prepare a Tender package including building plans and a written specification for the building works. Obtain written quotations from local builders. Prepare written Contracts between you and your builder. Monitor works on site with weekly site visits. Advise on how any changes to the work will affect timescales and costs. Issue certificates for payment to the builder ensuring costs are monitored. We also offer a complete service for the architectural design of new houses, bungalows and apartments. To help understand your project we offer a computer generated 3D views service which can also be used for marketing purposes or to advertise future developments. Three dimensional visuals can provide you with an accurate impression of your design project. The scale and complexity of the views can be defined to suit your requirements. Whichever you choose, we will make an initial FREE OF CHARGE visit to your home to discuss your project. * Please note: Prices vary depending on the size and complexity of the project.